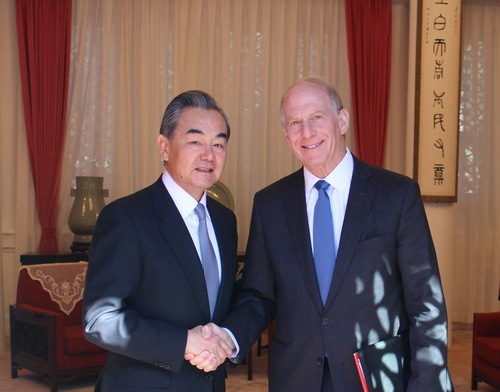 On October 10, 2018, State Councilor and Foreign Minister Wang Yi met in Beijing with President of the Council on Foreign Relations Richard Nathan Haass of the United States (US). Both sides mainly exchanged views on China-US relations. Wang Yi stressed that the current China-US relations are at a critical juncture. Maintaining the sound and stable development of China-US relations conforms to the fundamental interests of the two countries and is also a common expectation of the international community. Both sides should manage differences, enhance trust and reduce misgivings, and expand cooperation in line with the spirit of non-conflict, non-confrontation, mutual respect and win-win cooperation. Richard Nathan Haass expressed that US-China relations are of great importance for the two countries and the world. At the current stage, the two sides should especially strengthen dialogue and communication, manage differences and frictions and propel cooperation in various fields, in a bid to promote the stable development of US-China relations.